The Norwich terrier originated in United Kingdom in the 19th century and is one of the smallest terrier dog breeds. The Norwich and Norfolk are almost the same breed with two different ear types and both of them are from Norwich terrier. English people were the first to separate them in 1964 and after that the AKC accepted them as a recognized breed, the different between the NORWICH and NORFOLK is that the Norwich has a small perked ear while the Norfolk has a dropped ear. Generally these dogs are strong their head is rounded with a space between the ears, the eyes are dark in color and ears are standing and alert. This dog breed has a nice straight coat the coat can be red, wheaten tan,and black-tan. 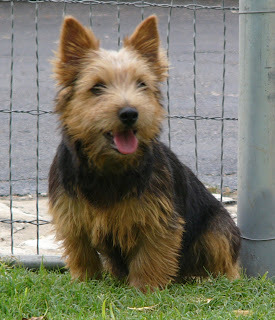 The Norwich Terrier are well behaved, strong, courageous and a balanced breed with a clear head. This dog breed are good learners and are easy to train, effective and consistent training can make them more steady and balanced, they are good with every one specially children and other pets. Daily cleaning and brushing of the coat is important to clean dead and dirty hair, bath can be given with a shampoo when it is needed. This dog breed is good for apartments if they are provided regular exercise and are good indoors without a yard. AS these dogs are geared towards work it is important to take them on a daily walk. This breed of dogs is generally a healthy breed, some lines are prone to back problems and genetic eye diseases but overall a healthy breed living between 12-15 years. Even healthy dog breeds might face medical problems and dog diseases, so keep looking out for symptoms of common diseases and ensure an early diagnosis and treatment if you notice something.